Reminder: National Drug Take-Back Day is this coming Saturday, April 28, 2018. 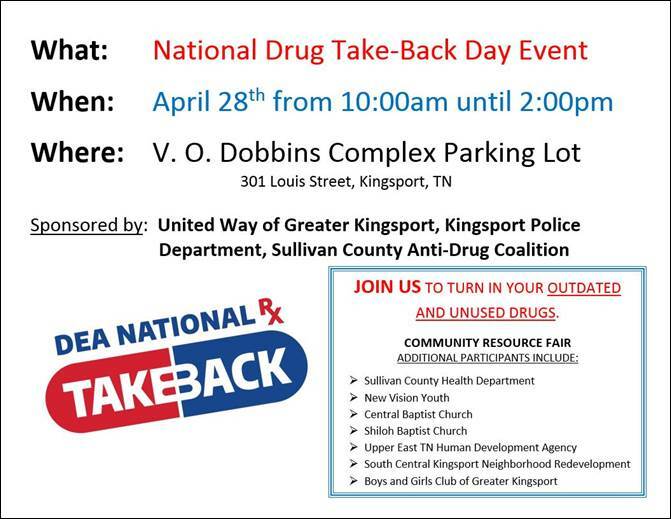 The Kingsport Police Department and other community partners will be conducting a local drug take-back event from 10:00 AM until 2:00 PM in the parking lot of the V.O. Dobbins Complex, located at 301 Louis Street. Please consider cleaning out your medicine cabinet between now and then and bringing your expired or leftover medications to us for safe disposal.